Dutch farmers just say no to antibiotics for livestock. 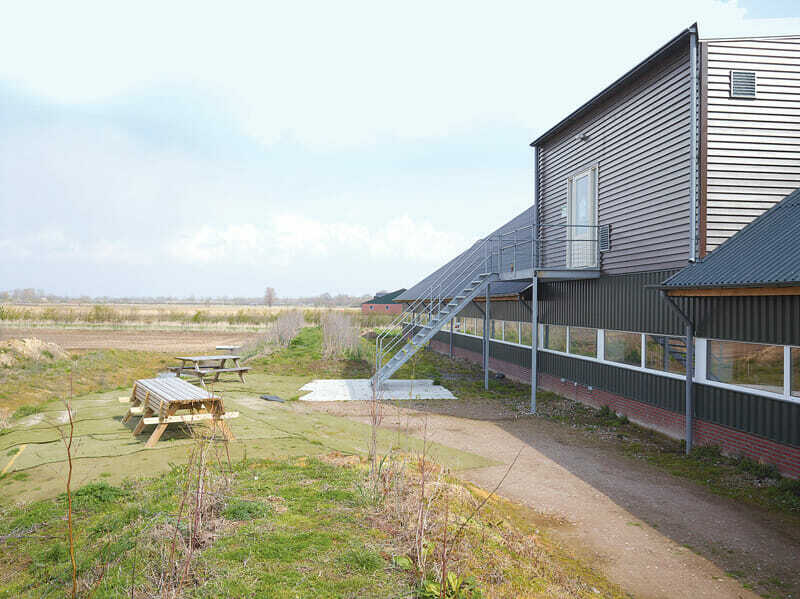 To American eyes, the Hoeve de Hulsdonk farm, outside the small town of Beers in the southeastern Netherlands, looks like some radical exercise in farming transparency. There’s a bike trail to lure you onto the property, and picnic tables to keep you there. The dark metal barn, towering two stories above the farmhouse and tractors, has huge horizontal windows punched into its sides. And if you’d like a better view of the more than 17,000 pigs raised there each year, you can climb stairs to a public viewing parlor, and look down on the hogs from above. 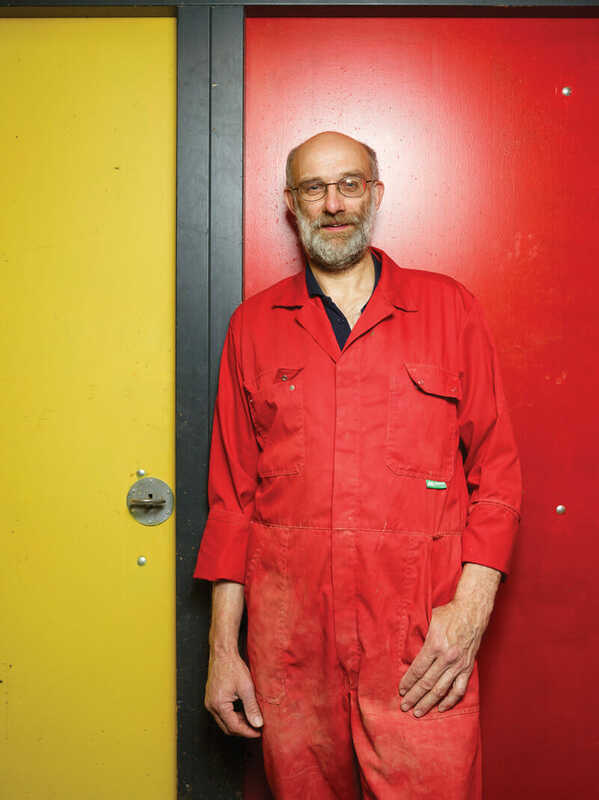 All this because owner Gerbert Oosterlaken believes the more you can see, the better. Along with every other livestock producer in the Netherlands, Oosterlaken is in the midst of a high-stakes, government-mandated experiment: Can large-scale meat production succeed without routine use of antibiotics? “Growth promoters,” the microdoses of everyday antibiotics given to livestock to fatten them, have been banned in Europe since 2006 – but the Netherlands decided to go even further. Since 2009, Dutch farmers have cut animal drug use by half without harming either animal welfare or their own profits. Four years into the project, their accomplishment has huge implications for farming throughout the world. 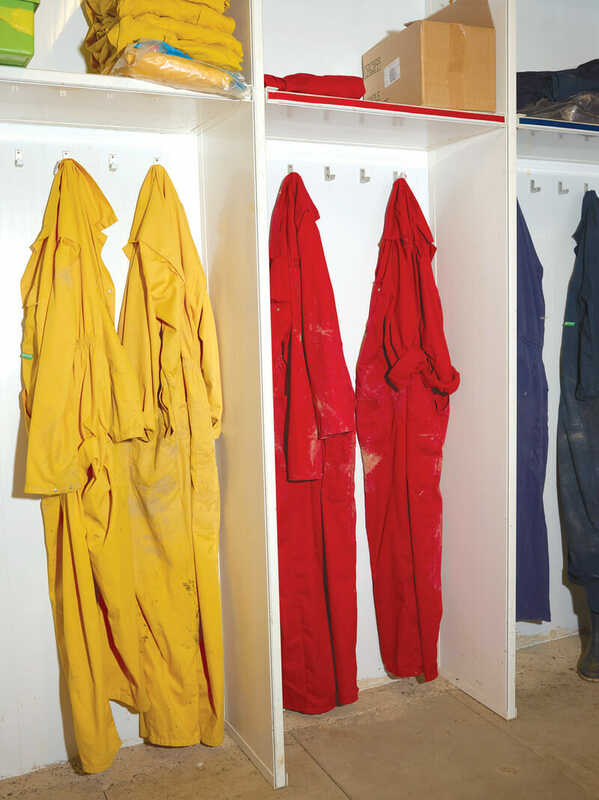 Overalls and boots whose colors correspond to different zones, helping control the spread of diseases. Antibiotics have been a crucial (and controversial) component of meat production for decades. In the late 1940s, biologists inadvertently discovered that feeding livestock tetracycline made the animals grow faster and from that revelation, an industry was born. Today, food-producing animals raised and eaten in the United States receive almost 30 million pounds of antibiotics per year. That’s several times what our country’s 300 million humans take and, unlike humans, animals receive antibiotics when they are not sick. Most of those 30 million pounds are given to pigs, chickens and cattle in small doses every day, for growth promotion and disease prevention – that is, to fatten them and protect them from the conditions in which they are raised. This routine drugging has been debated almost since farmers began doing it in the 1950s. The doses given to livestock’ to promote growth or prevent disease are smaller than the amount it would take to cure sick animals; they kill only the weak bacteria, letting stronger, drug-resistant ones survive and spread. British scientists began detecting a spike in antibiotic-resistant infections in humans in the 1960s, and in 1977, the U.S. Food and Drug Administration tried to ban some routine animal dosing, blaming it for increasing amounts of antibiotic resistance. Since then, hundreds of scientific studies have traced a link between antibiotic use in livestock and antibiotic-resistant bacteria on farms and in the outside world. At the same time, antibiotic-resistant human illnesses have been worsening around the world, producing what the director of the U.S. Centers for Disease Control and Prevention calls “nightmare bacteria” that cannot be treated by traditional methods. So if the Netherlands can reduce routine antibiotic use without harming its farmers’ survival, maybe other countries can, too. Large-scale agriculture proponents reject any link between farms and human health problems. In publications and testimony, spokespeople for conventional meat production have said that taking away antibiotics would cut productivity and raise costs. But the Netherlands’ success demonstrates this isn’t true. The country is tiny, but its livestock-raising is intensive and high-tech: 17 million people and about 118 million farm animals share a space only the size of Maryland, yet the Netherlands is Europe’s leading meat exporter. So if the Netherlands can reduce routine antibiotic use without harming its farmers’ survival, maybe other countries can, too. Ten years ago, the Netherlands was in a paradoxical position. It had very low rates of antibiotic resistance as a result of strict rules for infection prevention in hospitals and mutual agreements about when to use the most powerful drugs. “In human health care, we’ve been top of the class,” says Marieke Mossink, head of the infectious diseases division at the Ministry of Health, Welfare and Sport. “So the difference between our health care and our agriculture was huge.” It turns out that farms in the Netherlands were European leaders in antibiotic use. 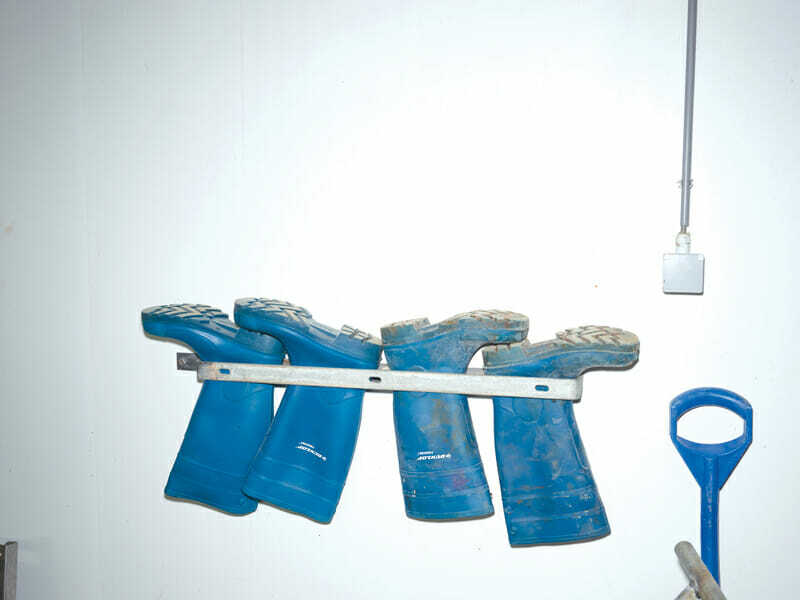 With the intention of preventing disease, it takes two to three days to thoroughly disinfect the floor and clear it of manure. The idea that farming could transmit a threat to the rest of society shook national confidence. “Many people in the Netherlands have animal production at their back door, so they are always looking at what’s happening,” says Dr. Albert Meijering, a policy officer at the Ministry of Economic Affairs. The “pig MRSA” outbreak – subsequent investigations found the bacteria throughout Europe and in Canada and the U.S. – was followed by another shock: an outbreak on goat farms of Q fever, a disease so infectious that the U.S. government considers it a potential bioterror agent. The final blow was the 2009 discovery that another drug-resistant infection, more serious than MRSA, was infiltrating the country. This one, which goes by the acronym ESBL, was spreading via gut bacteria, even in people who had no obvious link to farming. And when researchers looked for the source, they found it in food animals, identifying the related bacteria in patients, in chickens and on chicken meat. So, the Dutch minister of agriculture, Gerda Verburg, decided to be bold. She brought the evidence of antibiotic use and its health risks to powerful private organizations (analogous to the U.S. Poultry & Egg Association and National Pork Producers Council) that oversee the raising of different types of animals. With their buy-in, she developed a tough new policy: No more preventive dosing. Antibiotics after a veterinary inspection only. And farmers would be expected to cut their use severely: by 20 percent in one year, and 50 percent in three. It could have sparked a revolt. Instead, Dutch farmers buckled down. In 2013, the ministry announced that antibiotic sales to livestock farms dropped 56 percent between 2007 and 2012. Farmers had effectively stopped using the most-critical drugs, the ones that posed the greatest risk of creating dangerous resistance in humans. Gerbert Oosterlaken, on his farm. 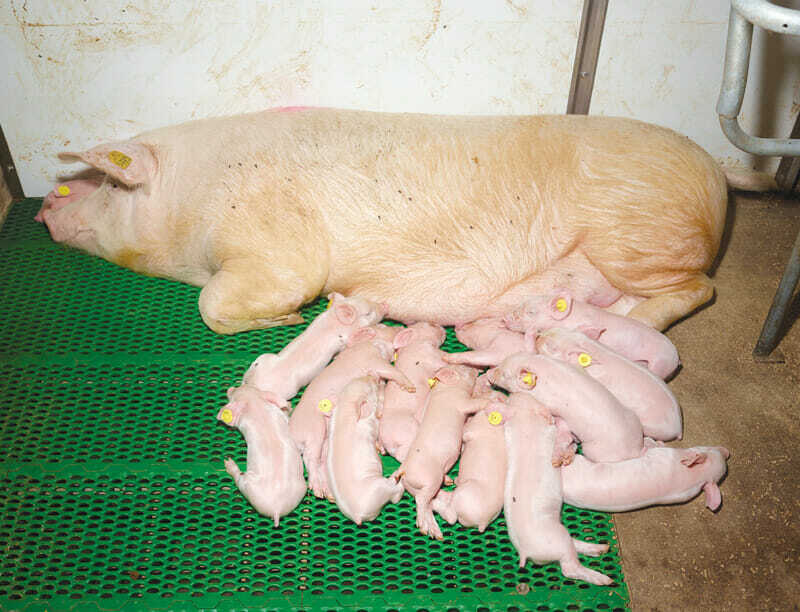 A sow sleeps with her piglets. Because stress can trigger disease, the babies are kept with their mother longer than usual. The visitor's center on Oosterlaken's farm. 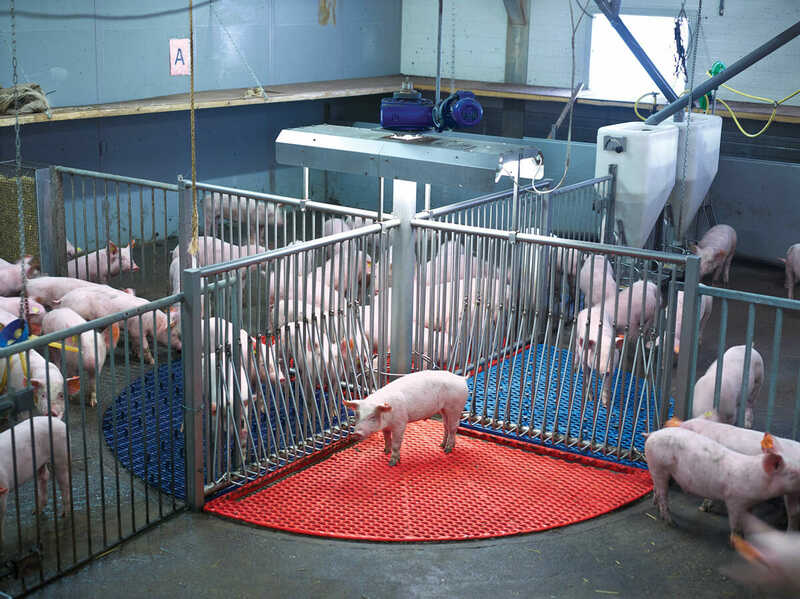 The mere act that he allows visitors to visit his pig operation is emblematic of the difference between the American and Dutch perspectives on agricultural protocol. Most large-scale livestock operations in the U.S. discourage gawkers. The Dutch government’s new antibiotic system is complex but straightforward. Because antibiotics can only be obtained by prescription – not, as in the U.S., from a feed mill or a farm-supply store – veterinarians are the gatekeepers. In fact, farmers must register the name of the veterinarian they work with, which prevents them from shopping around. All farm drug prescriptions become part’of a national database, and farms raising the same type of animal are ranked against each other to gauge how well they are doing. (This year, veterinarians will be ranked against each other as well, to reveal who is prescribing the most drugs.) Antibiotics are also rated; to prescribe the drugs most likely to stimulate serious resistance, a veterinarian must demonstrate that a susceptibility test has been performed and that no other drug will work. There are points of tension. Disease-prevention dosing can be a hedge against sloppy practices: With the drugs no longer available, farmers have to pay close attention to hygiene, diet and stress. Not all are willing to do so. 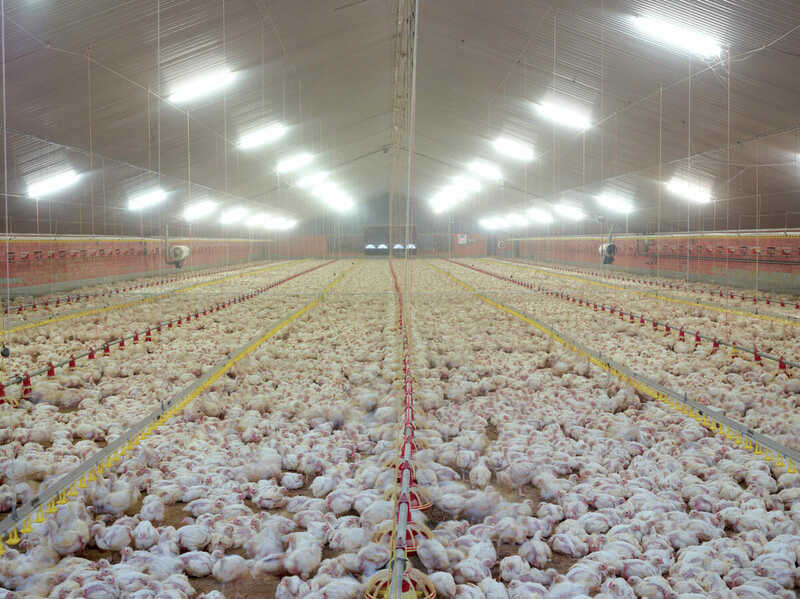 A Dutch broiler farm that 160,000 chickens call home. 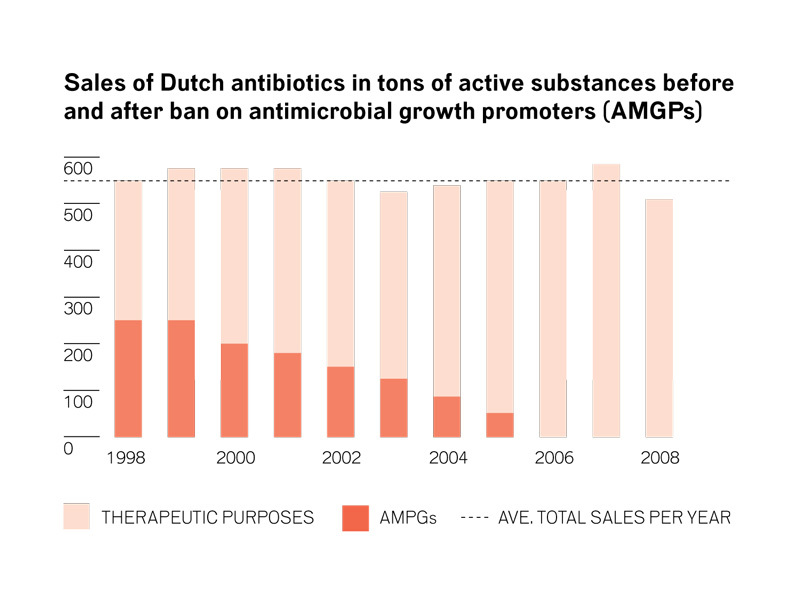 The Dutch government's new program for restricting antibiotics began in 2010. 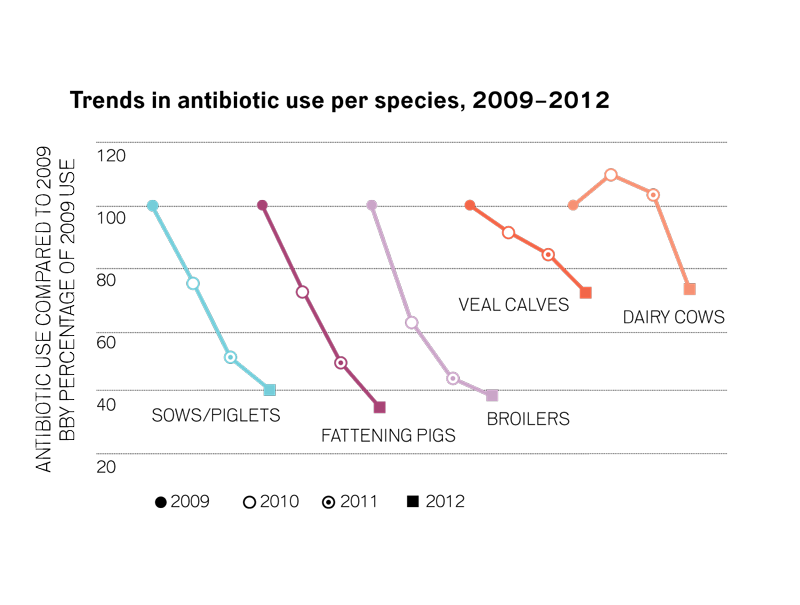 The graph shows why: Despite a ban on growth promoters, antibiotic use did not diminish. Compared to 2009, the last year of unrestricted use, antibiotic use per type of animal fell sharply. Oosterlaken also revels in the challenge of farming without the crutch of antibiotics, and proudly shows off the changes he has made on his farm. 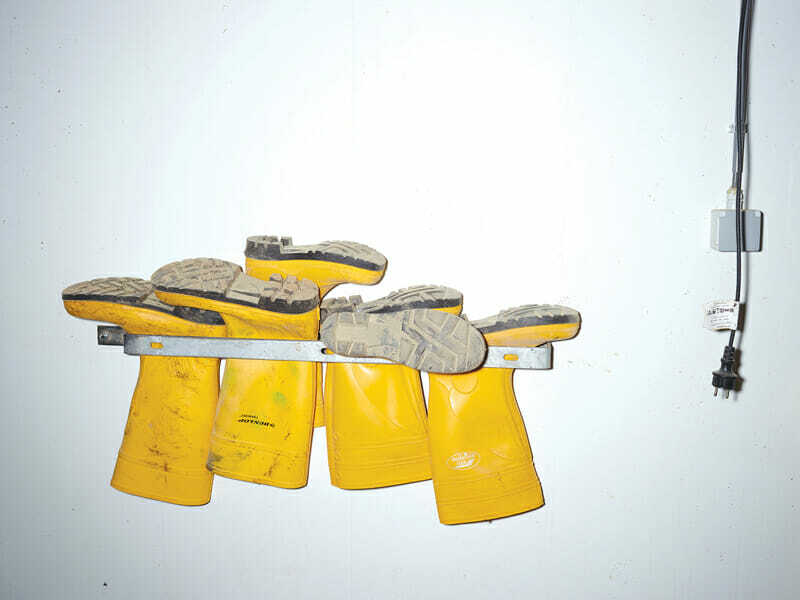 He is obsessive about biosecurity, requiring visitors to shower and shampoo, change into fresh clothes and underwear that he supplies and then don scrubbed boots color-keyed to different areas. 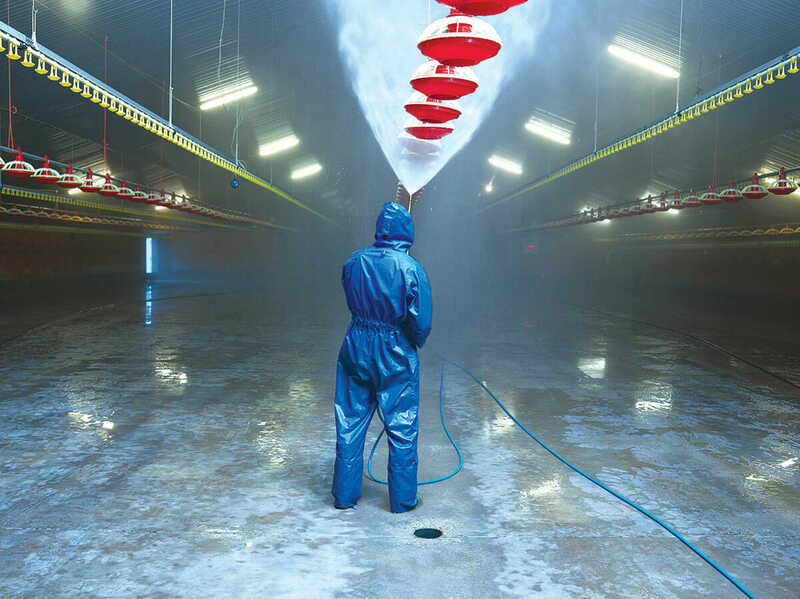 He keeps his barns warm and installed filters to strain ammonia from the air. He lets his sows bear their litters in “loose pens” that keep mother and offspring together, leaves the piglets with their mothers a week longer than standard and feeds them on the pen floor instead of a trough so they eat more slowly. “Really, what we have done is go back to old systems,” he says. This could be the proof that recalcitrant countries like the U.S. will require to think about similar changes. It is validation that the Netherlands needs as well to keep antibiotic reduction going. The Ministry of Agriculture has set’a new goal of reducing drug use again. It wants to force antibiotic use on farms down to 30 percent of where things were before the program started. This stage, everyone agrees, will be the difficult one. Interviews with farmers and ministry staff were arranged by the Embassy of the Kingdom of the Netherlands in cooperation with the Pew Charitable Trusts. This story was produced in collaboration with the Food & Environment Reporting Network, an independent, nonprofit news organization that paid reporting and travel expenses.